Although RuneQuest III (Avalon Hill) was my introduction to RuneQuest, it didn't take long for me to find RuneQuest 2 and fall in love. It was my go to system after AD&D and my group spent many a Saturday afternoon exploring the ruins of Big Rubble and the manipulations of Pavis. Good times. To see it will be coming back in print is awesome (sure, called "Classic RuneQuest, but we know the truth - anything before Avalon Hill is gold.) I'm very excited. Now the question is - how soon? It's not mentioned yet at the Chaosium site. I am guessing early 2016. Over on Google+ Rick Meints posted an image of the ToC and it has a January 2016 date on it. With the expense of printing 7th ed CoC (apparently there was no money from the Kickstarter left to print any copies), I would think the new management over at Chaosium needs as much cash flow as possible. 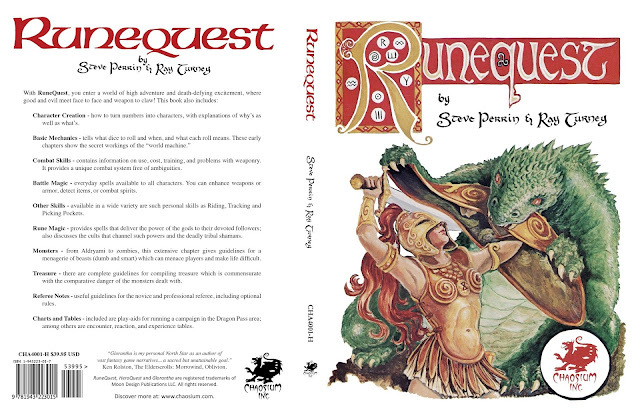 And since this was once the best edition of Runequest, it makes sense to reprint it for a quick influx of needed cash. Is this for real? Like for real real? I guess the limbs will be a'flying again! Here is a link to the Google+ post where it was mentioned (from the OSR group). Very good idea. They should publish some kind of companion that includes whatever is useful from the Avalon Hill version (Naval Rules and alternate character creation by culture for example) and otherwise pretend Avalon Hill RuneQuest never happened. If you're looking for an improved RQIII you may want to try out RQ6. The reprint is for grognards who fondly remember the old days. Wow. I saw Rick's post and assumed it was some sort of unauthorized fan creation. Now...wow. I might have to return to RQ2 again. It was my go-to alternative to AD&D (along with T&T) for most of the 80's and even though I liked RQ3 a lot RQ2 was still more accessible and concise. This is as legit as it gets. Chaosium has all the rights, copyrights, and trademarks related to this at long last.